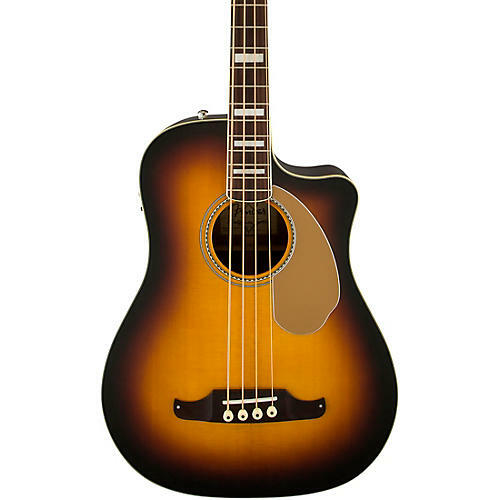 The deeply resounding Kingman Bass SCE has been upgraded for discerning acoustic bassists. New features include a vintage-inspired three-ply gold pickguard, bone nut and vintage-style Fender “Viking” bridge with compensated bone saddle-all in addition to the classic Fender Jazz Bass headstock, tuners, neck profile and strap buttons that make it such a distinctive instrument. Other premium features include a cutaway body with solid spruce top, scalloped "X"-bracing and mahogany back and sides for defined and resonant bass sound, stylish body binding and checkerboard rosette, maple neck, 20-fret fingerboard with block position inlays and aged binding, forward strap button with internal block reinforcement, chrome hardware, gloss neck and body finish and Fishman Presys pickup system with active onboard preamp and tuner for loud and clear amplified sound.